For the independent charity focusing on group relations, see Tavistock Institute. For the arm of the charitable Tavistock Institute of Medical Psychology, see Tavistock Relationships. The Tavistock and Portman NHS Foundation Trust is a specialist mental health trust based in north London. The Trust specialises in talking therapies. The education and training department caters for 2,000 students a year from the United Kingdom and abroad. The Trust is based at the Tavistock Centre in Swiss Cottage. The founding organisation was the Tavistock institute of medical psychology founded in 1920 by Dr. Hugh Crichton-Miller. It has long been regarded as a professional centre of excellence of international renown, in its application of psychoanalytic ideas to the study and treatment of mental health and interpersonal dynamics. The institution is notable for the great number of publications that have issued from it and its continuing engagement in a broad dialogue on the major social issues of the day. Its approaches have in the past been seen to be influential in the British Army, the English Prison service, aspects of the judicial system, the Probation Service, in Education, Social Services, the National Health Service, in Management consulting across industry and in the arts. Its signal attribute has been the Multidisciplinary approach to its work. The main challenge to its influence appears to be driven by accountancy-led policy. Threats to the Clinic's organisational and financial survival have surfaced from time to time. At one such juncture, in 1994, it joined forces with the neighbouring Portman Clinic in Fitzjohn's Avenue. The Portman specialises in areas of Forensic psychiatry, including the treatment of addictive, sociopathic and criminal behaviours and tendencies. 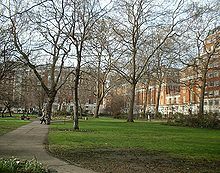 Tavistock Square in Bloomsbury London, birthplace in 1920 of the eponymous Clinic. It owes its name to the fact that its original location was in Tavistock Square in central London. When it moved later to larger premises, it took its name with it. Although Hugh Crichton-Miller was a psychiatrist who developed psychological treatments for shell-shocked soldiers during and after the First World War, clinical services were always destined for both children and adults. The clinic's first patient was a child. From its foundation it was also clear that to offer free treatment to all who need it meant that the Tavistock Clinic needed to generate income by providing training to clinical professionals who could eventually help people across the UK and beyond. The clinical staff were also researchers. These principles remain influential to this day. Following its foundation the Tavistock Clinic developed a focus on preventive psychiatry, expertise in group relations – including army officer selection – social psychiatry, and action research. 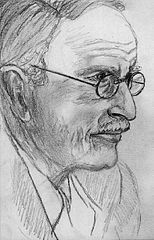 There was an openness to different streams of research and thought as for instance the famous series of lectures given by the Swiss psychiatrist and one time collaborator of Sigmund Freud, Dr. Carl Jung, which were attended by doctors, churchmen and members of the public, including H. G. Wells and Samuel Beckett. Its staff, who were still mainly unpaid honorary psychiatrists, psychologists and social workers, were interested in researching and consulting to leadership within the armed forces. The staff also offered treatment to members of the civilian population who might be traumatised by the prospect of a further world war, which could bring bombing of cities, evacuation of children and the shocks of loss and bereavement. After the Second World War, the Tavistock Clinic benefited from the Northfield Hospital experience and from the arrival of talented professionals from Europe, many fleeing Nazi persecution. In 1948 it became a leading clinic within the newly created National Health Service. At this point its education and training services were managed separately by the Tavistock Institute for Medical Psychology, which was also the umbrella for the Tavistock Institute, involved in social action research and thinking about group relations and organisational dynamics, and for work with marital couples. The clinic was managed on a democratic model by a professional committee and developed further its distinct focus on multi-disciplinary and community-centred work. New developments in child and adolescent mental health were particularly fruitful in the immediate post-war period. In 1948 the creation of the children's department supported the development of training in child and adolescent psychotherapy. Dr John Bowlby supported this new training and naturalistic infant observation. He also developed Attachment Theory. Clinicians James and Joyce Robertson showed in their film work the impact of separation in temporary substitute care on young children for example, when their parent was admitted to hospital. The Tavistock Clinic opened its Adolescent Department in 1959, recognising the distinctive developmental needs and difficulties of younger and older adolescents. In 1989 the Tavistock established the Gender Identity Development Service (GIDS), a highly specialised clinic for young people presenting with difficulties with their gender identity. By the 1960s The Tavistock Clinic was also providing both 1-year and 4-year professional training courses in educational psychology, the latter embracing a teacher training element through Leicester University School of Education. For a number of years the senior tutor and principal psychologist for these courses was Irene Caspari who did much to promote the concept and practice of Educational therapy. In the 1970s systemic psychotherapy became the Tavistock Clinic's newest professional training. Applications of the clinical ideas and skills of its multidisciplinary clinicians are at the heart of its education and training, with academically validated programmes developing from the early 1990s with the University of East London, and later with the University of Essex and Middlesex University. Work discussion, supervised clinical practice and experiential group relations work are central to many trainings all of which aim to equip mental health workers with the emotional, organisational, and relational capacities to operate confidently in front line settings. A BBC TV series 'Talking Cure: Jan' brought the work of the Clinic to a wider audience in 1999 and remains relevant today. Organisational consultancy by former CEO, Dr. Anton Obholzer, featured in the TV series, and their edited collection, with Vega Roberts, 'The Unconscious at Work: Individual and Organizational Stress in the Human Services', remains one of the classic texts to emerge from the Tavistock Clinic. The Tavistock's tradition of social and political engagement has been renewed in recent years through its programme of Policy Seminars which model a dialogic, exploratory approach to policy analysis and debate with the social epidemiologist, Richard G. Wilkinson, the psychologist, Oliver James and the columnist, Polly Toynbee, among recent contributors. The series of Thinking Space events follows a similar model of participatory engagement around themes of diversity, racism, and sexual orientation. The Tavistock Institute, which had been part of the Tavistock family, moved to its own premises in 1994. The Tavistock Centre for Couples Relationships, TCCR, formerly the Tavistock Institute of Marital Studies, was always a separate, charitably-funded organisation which left the Tavistock Centre for new premises in 2009. In 1994 the Tavistock Clinic joined with the Portman Clinic to become the Tavistock and Portman NHS Trust. In 2006 the Trust acquired Foundation Trust status and become the Tavistock and Portman NHS Foundation Trust. The Trust provides clinical services for children and families, young people and adults. It also provides multi-disciplinary training and education. These programmes include core professional training, for example in psychiatry, psychology, social work and advanced psychotherapy training, as well as applied programmes for anyone working in the mental health or social care workforce. Since 2010 the clinical work of the Trust has diversified with new services such as the Family Drug and Alcohol Court in Milton Keynes and the City and Hackney community psychotherapy service. The Trust is an active member of UCL Partners, the Academic Health Service Centre located in North London. It was named by the Health Service Journal as one of the top hundred NHS trusts to work for in 2015. At that time it had 449 full-time equivalent staff and a sickness absence rate of 0.92%. 84% of staff recommend it as a place for treatment and 73% recommended it as a place to work. Paul Burstow, former Coalition government health minister, became Chair of the Trust in November 2015. The Trust borrowed £58 million in 2016 which it intends to repay by selling its current sites. Over the years many hundreds of staff members, at all levels, have contributed to the work of this institution. This list is merely representative of some of the lasting contributors to the different fields encompassed by the Clinic. In line with Hugh Crichton-Miller's original vision for clinics to be set up in communities across the country, his dream was not realised in his 'native' Scotland for another 50 years. However, with Jock Sutherland's return to Edinburgh in 1968, he became the catalyst for the formation of an organisation modelled on the London centre, albeit on a smaller scale. The Scottish Institute of Human Relations (SIHR) was constituted as a charitable educational institution in Edinburgh in the early 1970s. Eventually a branch was opened in Glasgow. The 'MacTavi', as it was sometimes fondly called, worked closely with the National Health Service in Scotland and provided psychoanalytic training and courses for professionals in the health and educational systems and beyond. It also guided adults and children into treatment for the forty years of its operation. SIHR was finally dissolved in 2013 and its centres closed down. Some of its functions were taken over by a number of other organisations, specifically psychoanalytic training has become the remit of the Scottish Association for Psychoanalytic Psychotherapy (SAPP). ^ Crichton-Miller, Hugh (1922). The New Psychology and the Parent. Jarrolds. Retrieved 16 November 2016. ^ "History". Tavistock and Portman nhs trust. Retrieved 11 September 2016. ^ Jung, C.G. (1935). Tavistock Lectures, in The Symbolic Life. Collected Works, vol.18. London: Routledge. pp. 1–182. ISBN 0 7100 8291 6. ^ Pincus, Lily. Personal Postscript (1984). "Bereavement Care". Bereavement Care. 3 (2): 15–18. doi:10.1080/02682628408657111. ^ "About us | GIDS". gids.nhs.uk. Retrieved 5 December 2017. ^ "Talking Cure: Jan". bbc 2. November 1999. Retrieved 11 September 2016. ^ "Our History" (PDF). Tavistock and Portman NHS Foundation Trust. Retrieved 11 November 2016. ^ "Court is supporting families to stay together in Milton Keynes and Buckinghamshire". MK Web. 25 February 2015. Retrieved 20 March 2015. ^ "The many sides of the Tavistock & Portman: educator, innovator, incubator, disruptor". tavistockandportman.nhs.uk. Retrieved 5 December 2017. ^ "Trusts borrow millions to pay for redundancies and beds". Health Service Journal. 7 June 2016. Retrieved 31 July 2016. ^ Pines, Malcolm. 'Bion, Wilfred Ruprecht (1897–1979)', Oxford Dictionary of National Biography, Oxford University Press, September 2004; online edition, May 2007. Retrieved 10 September 2008. ^ Holmes, J. (1993). John Bowlby and Attachment Theory. Makers of modern psychotherapy. London; New York: Routledge. ISBN 0-415-07730-3. OCLC 27266442. ^ Stein, Mark (2005). "Obituary: Harold Bridger". The Guardian. Retrieved 18 November 2016. ^ "About Us". Caspari Foundation. Retrieved 3 February 2017. ^ Sutherland, J. D. (October 1977). "Henry Dicks". The Psychiatrist. 1 (4): 6–7. doi:10.1192/pb.1.4.6. ^ Draper, Ros; Gower, Myrna; Huffington, Clare (1991). Teaching family therapy. London: Karnac Books. ISBN 978-1-85575-021-0. ^ Hoxter, S. review of Collected Papers of Martha Harris and Esther Bick, Journal of Child Psychotherapy, 14a: 101–106 (1988); D. Dawes and M. Boston (eds. ), The Child Psychotherapist (London: Wildwood House, 1977). Harris's description of the model, ‘The Tavistock training and philosophy’ (1977), is reprinted in The Tavistock Model: Papers on Child Development and Psychoanalytic Training by Martha Harris and Esther Bick, ed. M. H. Williams (London: Harris Meltzer Trust/ Karnac, 2011), pp. 1–24. ^ Cohen, Alan. "The Cohen Interviews Elizabeth Irvine" (PDF). Retrieved 17 November 2016. ^ Hahn, Alberto (2004). "Obituary of Donald Meltzer". International Journal of Psycho-Analysis. 86 (1): 175–78. Archived from the original on 15 April 2007. ^ Miller, Eric (1993). From dependency to autonomy: studies in organization and change. London: Free Association Books. ISBN 1 85343 335 7. ^ Ogilvie, Marilyn Bailey; Harvey, Joy Dorothy (2000). Marilyn Bailey Ogilvie, Joy Dorothy Harvey The Biographical Dictionary of Women in Science: L-Z. ISBN 9780415920407. Retrieved 18 June 2014. ^ "Tavistock Relationships – Our History". Retrieved 18 November 2016. ^ Dicks, Henry V. "John Rawlings Rees". Retrieved 23 March 2014. ^ "Albert Kenneth (Ken) Rice". ofek-groups.org. Retrieved 11 September 2016. ^ Steiner, John. Psychic Retreats, London/New York: Tavistock/Routledge, 1993. 176 pp. ISBN 0-415-09924-2, 176pp. ^ Symington, Neville (2007). 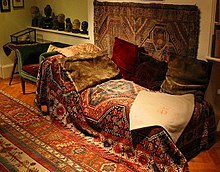 Becoming a Person through Psychoanalysis. London: Karnac Books. ISBN 9781855755406. ^ Miller Eric (14 June 1993). "Obituary: Eric Trist – People". The Independent. Retrieved 3 September 2012. ^ Trotter, Wilfred. Instincts of the herd in peace and war 1916–1919, London, Keynes Press, 1985." Medical History 31(1): 113–4. Jordan, E. (1909). "Herd Instinct and its Bearing on the Psychology of Civilized Man". Psychological Bulletin. 6 (12): 420–421. doi:10.1037/h0066945. ^ Williams Paul (2009). "Obituary:Arthur Hyatt Williams". The Independent. Retrieved 11 September 2016. ^ Crichton-Miller was actually born in Italy of Scottish parents and educated mainly in Edinburgh. This page was last edited on 9 March 2019, at 02:59 (UTC).